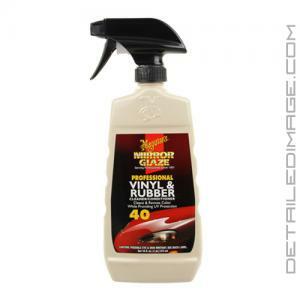 The Meguiar's Mirror Glaze Vinyl & Rubber Cleaner/Conditioner is sometimes better known as #40. It is a product that brings back to life vinyl and rubber pieces inside and outside your vehicle so they look better than new. The complex formula conditions those surfaces by forcing moisturizing agents in to the surfaces so your rubber and vinyl do not become dry and brittle. It revives the original color and it makes the interior look alive with an eye catching appearance. The same nutrients that condition the surface also force out dust, dirt and oils that may be trapped or stuck on the surface. The very safe and gentle cleaning properties remove surface contaminants so the surface is clean. Lastly it leaves a coating of UV inhibitors that preserve the rubber and vinyl from harsh UV rays. The vinyl and rubber will have a nice natural sheen appearance that does not feel slick or greasy. 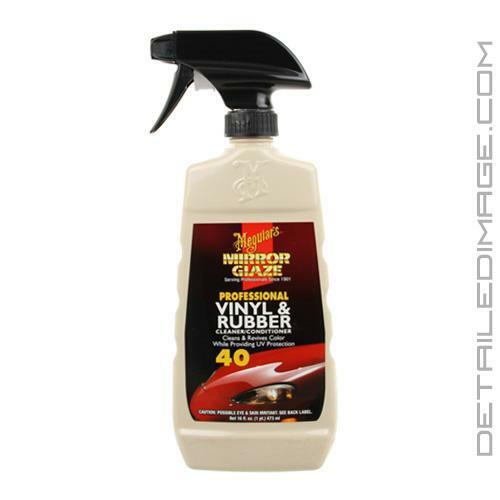 Use the Vinyl & Rubber Cleaner and Conditioner on your doors, dashboard, arm rests, exterior trim, engine bay, rubber moldings, and much more. To use it simply spray it on a microfiber towel or applicator, wipe the desired surfaces and you are all set. The M40 has everything you need in one bottle, try it today! DIRECTIONS: SHAKE WELL. Mist product onto applicator or surface, taking care to apply only to surfaces being treated. Spread evenly to ensure complete coverage. For a more matte-like finish, allow to penetrate and wipe off with a clean towel. NOTE: Do not use on tires or seats of motorcycles, bicycles or other two-wheeled vehicles or surfaces that should not become slippery. Keep off clear plastic. Test on a small, inconspicuous area for colorfastness.